OMBYA | Heal The People. Heal The Land. Heal The Planet. Our 501c3 group works with Costa Rica's local community, government and federal agencies to enhance the broad appeal and support for this project.. We will gather in Costa Rica and show the world what can be done to heal the people and heal the land. ►Providing healers and peacemakers of differing traditions, space where their collaborative energies can be used to assist those seeking their intercedence, reconnect with their own purpose and commitment and expanding the reach of ideas. ►Creating opportunities for the sharing and exchanging of ideas and experiences related to issues impacting the quality of life for all sentient beings on global and local levels. ►Creating educational opportunities for interested individuals from around the world to come together, learn and create nourishment for the overall endeavor. To create and produce a financial support system for peace generated organizations to continue their efforts to promote World Peace. Almanique was brought up in the Southern Baptist Church, Texas, USA. 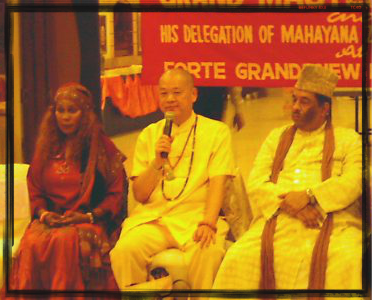 In the 1990’s she became interested in other spiritual traditions such as Chinese Buddhism and Sufism, and in 2005 she organized a historic meeting between Qi Gong Grandmaster Shan-Fo and Syen Aziz Nizami of the Chishti Sufi order at the legendary Hazrat Nizamuddin Shrine in New Delhi, India. The exchange instilled in Almanique a profound conviction of the ultimate unity of all religions and an unshakeable commitment to promoting interfaith understanding. In this vein, she was inspired to create Ombya, a foundation to facilitate such transformational interactions. Since then, she has been working tirelessly to make this vision a reality. We have already started the process by taking religious and spiritual group leaders to Costa Rica and shared the vision with them. With this process started we have received their input and they want to be a part of its growth and development. They are excited and see the power of a synergistic approach. To create a non-profit sanctuary located in Costa Rica where healers representing all traditions of healing from all over the world can retreat to replenish their energies and collaborate with others to share their philosophies, lessons and address the diverse issues necessary for the healing of the people, the land and the planet. 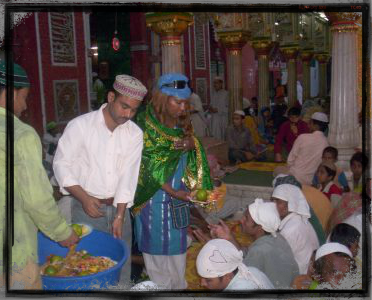 We accept all traditions of faith. Our obligation is to all people that need healing regardless to what issues that might be presented. (Ex. Solders with PTS syndrome OR issues arising from human trafficking). These issues will be covered by our renown healers. We are the apprentice for carrying out this mission. Donations help us grow and help more people. 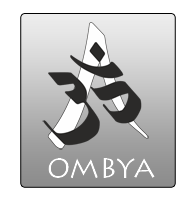 The OMBYA symbol means: “Who So Ever Knows This Syllable Obtains All He Desires” In the beginning many spiritual people believed that the world began with a sound and that was “OM”, the breath of creation. Maya only affects the manifested phenomenon. In this way the form of Om symbolizes the infinite Brahman and the entire Universe and the world. OmbyA is a 501c3 organization dedicated to supporting Spiritual and Global Leaders in their quest to heal the planet. We are in the planning stages to build a Sanctuary for “the Gathering” in Costa Rica where those involved in this work can come to replenish their energies and collaborate with others on the same path to learn, grow and better realize their individual missions. We live in a very complicated and interdependent world. When we share our perspectives we can see the whole and ultimately help others to thrive in this interconnected life. We believe that by creating an environment of beauty, peace and healing energies in which leaders of peace can support and energize each other. We will be able to create a ripple effect that can benefit the planet exponentially. Healers are a precious and special resource that are to be cherished and supported to expand their work. The sanctuary for “the Gathering” and healing centers will be created to operate on a self-sustaining basis, offering benefits to both healers and those in need. The world is in an unprecedented time of change and stressful living. People need resources to learn how to heal and thrive in their current conditions. Please join us in this vision of creating Heaven on Earth, where humanity evolves through peaceful collaboration and healing. This site in Costa Rica is amongst the purest fields of energy on the planet. Holy men and women chose this indigenous site through a very sacred and collaborative process. The very philosophy of the country is founded on peace. This land is a peaceful, nature sanctuary. It is adorned with caves, rivers, and waterfalls. 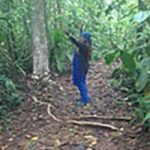 The 10-acre property has been protected in an area that focuses on eco-tourism. The entire area is dedicated to the support of well-being and peace with nature. How will the Sanctuary be sustainable? Peaceful leaders and healers from around the world will be invited to give workshops and healing intensives at a local hotel that was created with a “boutique” setting. A portion of the proceeds from these events, along with donations will go towards the sustainability of the sanctuary. These leaders will have access to the sanctuary to rejuvenate their energies and to collaborate with other spiritual leaders from around the world. This property gives them a sacred place to share their journeys and philosophies with each other and the world. The land has been chosen. We will be putting the land in escrow very soon. Buddhist monks called Sangha are valued as one of the three jewels in Buddhism. Buddhist Sangha by heritage, is pursuing the truth, is the world’s most respectful and rare person. Especially is respected for the congregation. Sangha, we rely on his guidance to lead a positive Buddhist view and walk on the Buddhist path. Since the Sangha dedicates themselves to practice Dharma and put all efforts to a considerable degree, they accordingly preach, earnestly teach us how to study Buddhism, Dharma. We, therefore, understand the meaning of life, the truth of the universe, our heart then open to the solution. From dropping the delusion, attachment to attaining what is comfortable and an eventual relief. So a big merit they offer us! How can we be ungrateful? How can we feel the gratefulness but not report it, not return it? Of course, the most direct method is to be a good student, pursuing the Dharma, make all Buddha happy. However, will any other methods are also practical, also benefit the Sangha? Whether if we can build with designs an energy repair center, a meditation place especially for them to use? They can take this garden to retain their ability and wisdom. Also, disclose our minds to their treasure: Let them physically and mentally get secured, guarantee them a beautiful, functional world to restore and enhance their power… our profit at the end. First, there are NO accidents or coincidences in the Universe.The prophecies of indigenous peoples for ages spoke about this time in our world and the conditions that exist on Mother Earth and the Sacred Elements (air, water, land resources, fires). I have received the message and ‘knowing’, that ‘Great Spirit’ is bringing messengers, healers, prophets and sacred medicine people together in ‘Divine appointments’. People who would never meet in life. People who are on completely different paths and even in different parts of the world. So when a woman I’ve never met, came up to me at a community event and said, ‘I have a friend you must meet’ and proceeded to set this meeting with 100 miles between 2 people, from completely different ‘walks of life’, but respectfully on the same ‘heart path’, I knew it was by a Divine hand at work. Meeting Almanique is a ‘life changing’ sacred moment. I fully believe that Creator has gifted her, myself and others an ancient prophesied vision of bringing the ‘Rainbow Warrior’ tribe together for not only healing Humanity but our Earth Mother and the Sacred Elements. It is not whether we need this sacred place in Costa Rica, but it is our moral and human duty to ALL living beings, to fulfill and build this sacred place that ‘Global Tribal Sacred Peoples’ of ‘ancient ways’ have prophesied and prayed for in sweat lodges, vision quest, sun dances, pilgrimages and sacred ceremonies for hundreds and hundred of years. My name is Clan Mother Rachelle Figueroa and I’m the Founder and Executive Director of The Morning Star Foundation. We are a Native/Indigenous organization with a Mission Statement to support and protect all Indigenous Elders and Sacred Traditions, from all Nations. It is so very important at this time on Mother Earth, to bring together all the Wisdom Keepers of all Cultures and Traditions for the healing and Unity of our World. The prophecies of many Native/Indigenous Nations say this is the time to rebalance the leadership of our Countries and Nations and to work together in a peaceful manner to bring Peace back for our future generations. The Elders are the door to these teachings. This is a very important project for all humanity and all living things!!! I fully support Amanique Jacquet’s amazing Costa Rican “Center for the Elders of the World” !!! At Umbral de la Montaña (The Mountain’s Threshold) our goal is to empower men and women, to teach and create visionaries, and to train modern shaman who will walk through their lives with strength and responsibility. Our goal is to envision a perfect world and then to dream into being.